First three pop-up death cafes: End of life care. Friends. Sudden death and suicide. 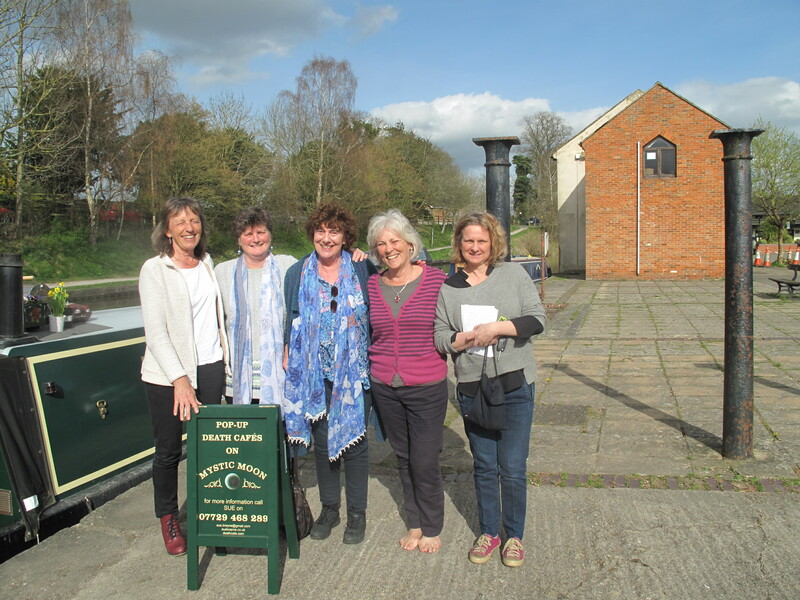 The first three pop-up death cafes on Mystic Moon have now taken place at Bradford on Avon wharf, Devizes wharf, and along the towpath at Pewsey. All three were very different, but completely special in their own way, and I am so grateful to all who came and spoke so honestly about their experiences of death and dying. Even though most participants didn’t know each other, I was amazed at how, very early on, themes emerged from each group, forming a wonderful bond of shared trust and understanding. I couldn’t possible write about all we spoke of, but I have hopefully captured salient points that came from each cafe. 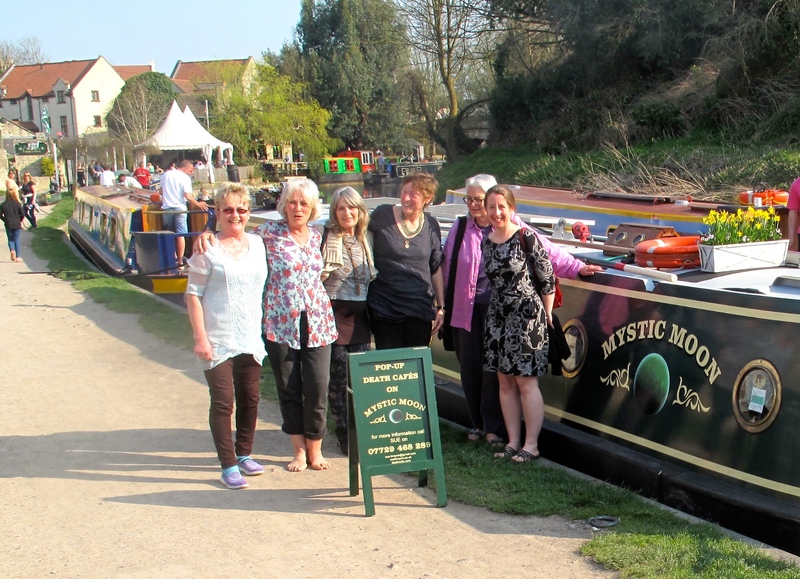 A beautiful afternoon at Bradford on Avon wharf welcomed four courageous souls to the first pop-up death café on Mystic Moon. 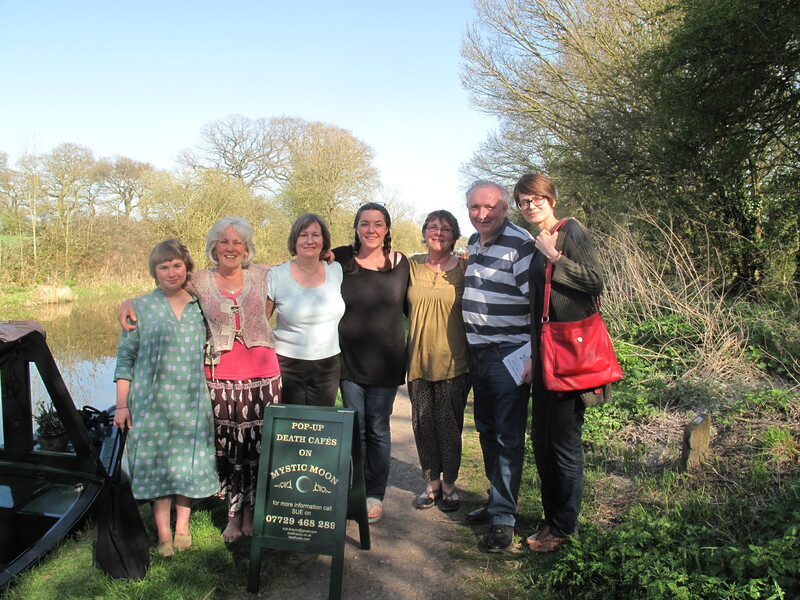 This was co-hosted by Liz Rothschild, funeral celebrant, manager of Westmill Woodland Burial Ground, and Director of the Kicking the Bucket festival. Two main threads ran through our meeting as we drank tea and munched on cake: caring for others as they die, and the importance of practically preparing for our own death. Sadly, we had all heard similar stories. One participant, an ex-paramedic, told us about the Lion’s Club Message in a Bottle scheme, which is a simple idea designed to encourage people to keep their personal and medical details on a standard form and in a common location – the Fridge (please go to the link for further information). We agreed it would be a great idea to add our Advance Directives, and even Wills, to the bottle! We moved on to talk at length about the changes that happen to a body after death. This led into a moving account from one participant about her mother’s death in hospital. She had no idea how quickly the undertaker would arrive after they had been called. She wasn’t ready for her mother’s body to be taken away, but was too fearful to ask for more time with her. ‘I felt as if she was being ripped away from me,’ she said. This prompted a conversation about the legalities of shrouds, open coffins, and funeral directors. Liz explained that it is not a legal requirement to use a funeral director, or have a coffin. She recommended Dying Matters and The Natural Burial Centre to those who wanted further information and resources about different ways of caring for the dead. We all agreed that we wished we could do more for those approaching the end of life, and to find ways of making their death better, even happier. One participant spoke of thinking about training as a soul midwife, which introduced the work of Felicity Warner and her School of Soul Midwifery. It was a thought-provoking way to conclude our pop-up death café, but our varied conversations had forced each one of us to think more carefully about the end of life care we want to receive, the importance of making an Advance Decision and making this known to our GPs as well as family members. It also made us more aware of the needs of those who are dying, and how we could care for them after death. But it was particularly gratifying to hear one participant say that this pop-up death cafe had inspired her to consider making a career in end of life care. This second pop-up death café was co-hosted by Rose-Anne O’Hare, an Occupational Therapist who specailises in Dementia. The main theme to emerge from the group was how to negotiate the very sensitive and often difficult relationship with the family of a friend who is dying. ‘Why do such awful things happen, when life seems to be going well?’ asked one participant. The third pop-up was co-hosted by Alexandra Wax, a psychotherapist who lives and works in Marlborough. As soon as we had gathered on Mystic Moon, sudden death and suicide emerged as the group’s main theme. This led to a conversation about how much better young people seem to be at dealing with death than older people. One participant told us that when the son of a friend was killed by a car, his friends carried his coffin, took an active part in his funeral, and still hold a memory day for him on the anniversary of his death. This entry was posted in All posts and tagged Pop-up death cafes. Death Cafes. End of life care. Sudden Death. Suicide. Mystic Moon. Bookmark the permalink.